Proportion is it is all about the relative relationships of the parts to each other and to the whole form. 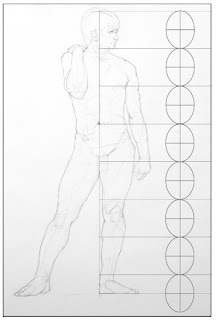 When drawing the human figure, we can use one part of the figure as a guiding measurement to compare the size relationships of the other forms found in the figure. 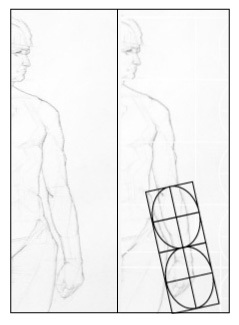 There are many approaches to this and artists have used different parts of the body as guides for figure proportions. The guide I was taught and use, is to compare distances between points on the body with the length of the head as the standard of measurement. 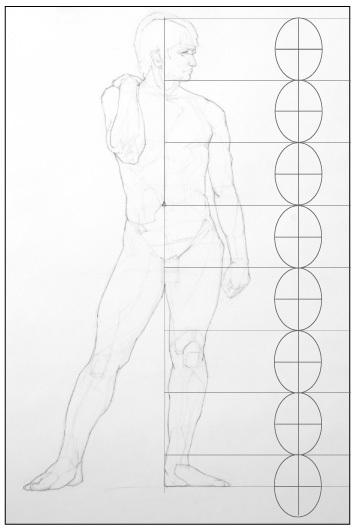 You may often see the figure height described in head lengths when artists discuss proportion of the human form. This simplifies the process of evaluating the relative sizes of the figure and its parts by allowing us to work from one reference point. Today, we will look at the proportions of the arm as it compares to the measurement of a head. We will look at the length of arm from the top of the shoulder down to the tip of the index finger. Then we will measure the components of the arm. The proportional model I am working from, here, is a figure that is seven and a half head lengths tall. There are other guides created by artists to use as a reference that use different amounts of head lengths. I like this one, so I use it as a general guide. Also, as a reminder, not everybody is 7 1/2 heads tall as there is variation in heights and proportions found within individuals, but this gives us a general starting point. Starting from the top of the arm (at the collar bone) going down to the tip of the index finger, the length of the arm is approximately three and a half head lengths long. 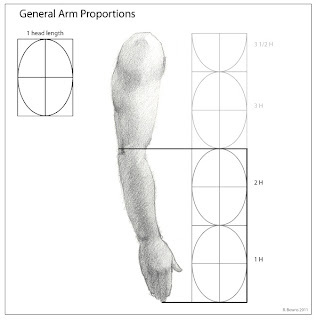 To show a couple of examples of the different approaches artists take to measuring the proportions of the arm I have listed a couple of different methods by two artists who have published their methods on proportion. Hogarth* starts with the collar bone (clavical) where it meets the arm and wrist as points of reference for measuring the arm, which he puts at two and three quarters head lengths long. Goldfinger measures from the top of the upper arm bone, humerus, to the first joint on the index finger. He puts the distance between the two at three head lengths. 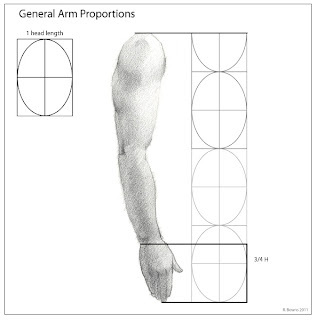 Artists use a different place of reference as a way to get the length of the arm. This is from the armpit to the tip of the index finger. This distance measures approximately three head lengths long. 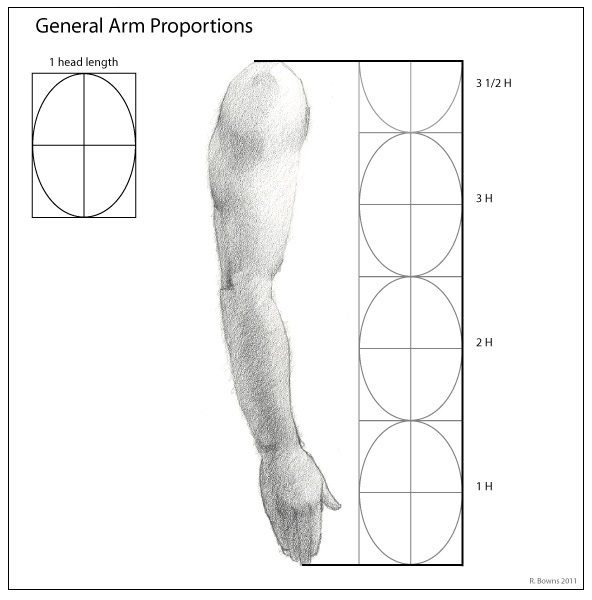 One thing to be careful of is that it can be difficult to determine where the point of reference for the armpit should be placed. I like to use points using the skeleton as reference points whenever possible, in this case the collar bone, as there is less guesswork involved. The distance between the elbow and the tip of the index finger measures approximately two head lengths. 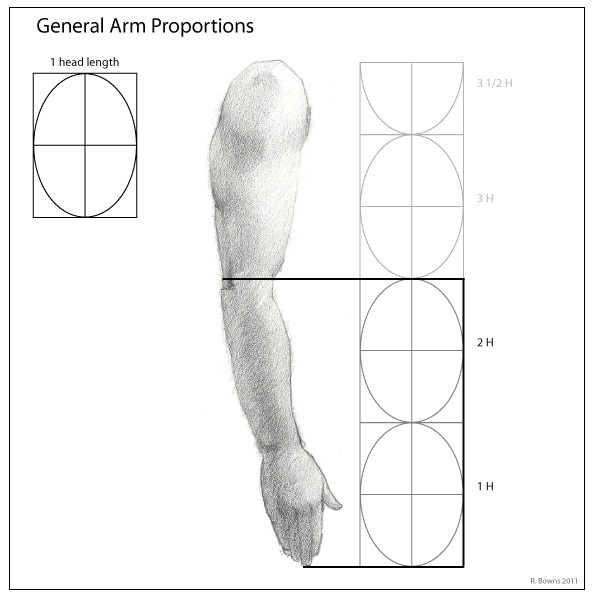 The length of the upper arm, or the distance from the top the humerus to the bottom, measures approximately one and a half head lengths. This plus the length of the lower arm and hand will equal three and one half head lengths. The hand measures approximately three quarters of a head length from the tip of the index finger to the wrist. These are good guides to help determine the proportional relationships of the arm. Remember people will vary from the general measurements listed above. 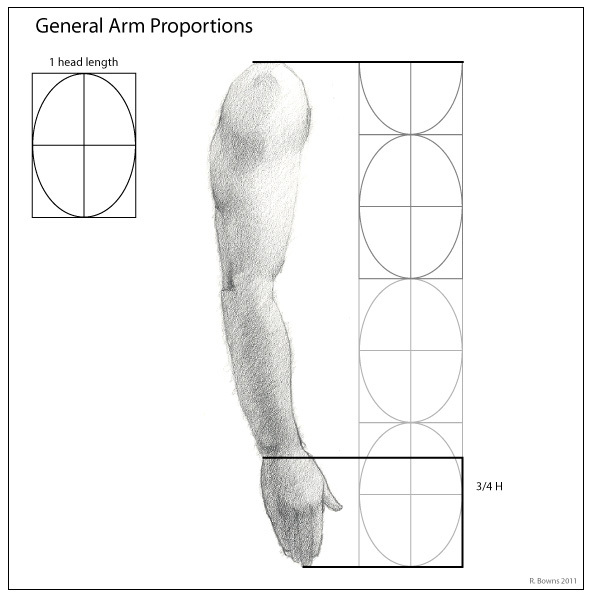 Depending on height and shape of the person the relationship between the arm and the head will differ a little but the above guides will give you a quick reference to work from. Foreshortening in perspective will also change the appearance of the lengths of the arm, but keeping the general proportional relationships in mind will help with the foreshortening. When drawing with a model as a reference sight measure the distances and see if they correspond to what is listed above. *Hogarth uses a 8 and 3/4 heads proportional figure.